1.Ana Wu: Could you please tell us a bit about your linguistic, academic and professional background? Eunhee: “Dad, how do you read this word?” As a little child, I always sat by my dad and looked over his newspaper while he was doing his daily routine job, which was starting each day by reading the newspaper. I was curious about the different characters in the newspaper which I hadn’t seen in any of my books or school books. I learned from my dad that they were Chinese characters. As a Korean, I grew up in a family of teachers. My grandfather taught Chinese. My uncles were teachers, and even in my generation there are many teachers including my own brother who teaches English in high school. I was always interested in how to learn a language. My mother was able to speak Japanese, and she used to teach me simple Japanese. Maybe because I was surrounded by teachers, I always wanted to be a teacher and to learn languages. English was such a big deal at school when I grew up and became a popular major among high school students when they chose their college major. I received my B.A. degree in English Education, so that I could achieve both goals of becoming a teacher and learning other languages. I took English, Chinese, and French classes. Japanese is one of my favorite languages even though I haven’t taken any regular classes. Before and during my undergraduate years, I had a good opportunity to work with American missionaries. Through them, one of my part-time jobs was to administer American visitors’ touring schedules and take care of their visits which included touring and interpreting for their needs and questions. I met hundreds of people that visited my country. In addition, I taught Korean to American and Canadian scientists during my college years. I came to the states and took one winter course in Quincy, Massachusetts, during my sophomore year. I taught several years after I graduated from college along with my part-time job for the American visitors. I decided to pursue a higher degree and enrolled in master’s program in Education specialized in English as a Second Language in Massachusetts. I taught in an elementary school for a year for my master’s practicum, which gave me a good grip for teaching here in the states. After I received M. Ed degree, I taught a year at a local kindergarten with all English speaking American children. As a result of these life experiences, I enrolled in a Ph.D program in Composition and TESOL and currently am writing my dissertation. My hope is to finish this summer. I have always loved to read and write, so I thought this program could give me a solid background. I received a Teaching Associate position after I finished my doctoral course work and taught two academic years. I taught College Writing and Research Writing classes to native undergraduate students of predominantly freshmen and sophomore students. Currently, I am teaching at a university as a temporary faculty teaching undergraduate liberal arts English classes. My students are all English native speakers. I am looking forward to finding a job where I can teach in my main field. I have a long way to go to more fully develop my professional field; however, my teaching experiences in EFL, ESL, and NS settings has given me a variety of perspectives and a good understanding of classroom dynamics, which I can certainly utilize in my teaching career. 2.Ana Wu: You teach mostly native speakers. What are their impressions? Has someone ever complained about having a NNES instructor? Eunhee: At first, to be honest, I was concerned about teaching native speakers especially since I was teaching English courses. My prior teaching experiences of children lessened my worries a little; however; it was a big deal for me. I had to trust myself in that I have had training to teach composition and research classes through my education experiences and have done additional studies and research. You may want to find my article in the Essential Teacher on March 2007 issue where I described my feelings. For the first semester, I was not able to catch my students’ responses in depth because I was a non-native English speaking teacher teaching English to my students. I was so concerned about my lesson plans, my teaching quality and enjoying each hour in my classroom with my students, I was unable to catch the students’ eyes looking at me as a non-native speaker. I loved being in the classroom with my students. My education efforts in both undergraduate and master’s degree programs illustrate this basic love of the student/teacher inter-relational education process. Actually, I didn’t notice any particular impressions of being a non-native speaker from my students. Maybe they were too shy or reluctant to show their complaints. Of course, once I got to the point of receiving my students’ evaluation instrument packet, I worried about their possible negative comments on my language performance. Interestingly enough, there were not any direct or obvious comments; however, I could tell that my language performance was not satisfactory for several students since a few students indicated that there were some unclear communications in terms of performing class assignments. As the semester proceeded, I became more comfortable with my students and my teaching as well. Indeed, I met different complaints about this or that, but the comments were not related to my teaching as a NNEST instructor. It may be that although my students’ complaints were not explicit, they may have subtle complaints about having a non-native speaker teaching English to them. 3.Ana Wu: What advice would you give NNEST graduates who are considering teaching freshmen composition classes? Eunhee: Be confident and prepare very well! To be a professional, we all understand that we need to fill our professional box with a variety of necessary tools. I am sure that graduate school programs prepare us well by enhancing our teaching skills, but once we step into our teaching field, we need to remember that every day is a learning moment. We need to be ready to select any tool from our professional box even though that tool may not fit at first. I am still working on the how to, what to, and where to of these questions and how they relate to the use of these tools. Also, I work to keep up on current theories and teaching writing methods. I took a Teaching Writing course last summer. We must learn to consult with our colleagues and professors. I am so thankful for having great people around me to share their insights and input with me whenever I ask for it or seek additional help for my teaching. To teach a freshman composition class, instructors also need to know about American high school English classes especially if they didn’t receive their high school education here in the states. This look into the American high school will give one a general look into students’ English background. It is also helpful to combine personal language course experiences and how you were taught and how you learned. I am sure that we all took our own language courses throughout our formative education years. For instance, I took Korean from the first grade to second year of college. All in all, it is a great opportunity, so GO FOR IT! 4.Ana Wu: What are the challenges of teaching NES versus NNES? Eunhee: One might say that teaching NNES requires more patience in terms of seeking fluent communication in all four skills; nevertheless, teaching NES also requires much patience to deal with the different levels of understanding and the comprehension of a topic. Or other challenges might be appear, for example, such as my Asian look, certain accents that we possess, different environments, unfamiliarity with the NES culture even though both NES and NNES have their own cultures, and so on. However, I think there are no significant differences between teaching NES versus NNES in terms of teaching English classes. It probably differs only in our teaching approaches and methods utilized in order to meet our students’ needs. 5.Ana Wu: When did you decide to teach freshmen composition? What was your training? Did you have a mentor? 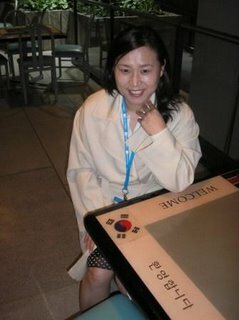 Eunhee: Actually, I didn’t have any intention – even though I assumed I would teach it since I enrolled in Composition and TESOL program – to teach freshman composition class till I was assigned by the department to teach it. My program was combined with both Composition and TESOL. Even though my specialty is in TESOL, I wanted to take several courses related to the Composition field. I had a different mentor each semester for my Composition and TESOL program, which I thought was a great opportunity to get advice from faculty who are accomplished professionals in the classroom. I worked with each mentor throughout the semester and received advice and comments on my classes. Ana Wu: Thank you for your time and good luck in your career! This entry was posted in Uncategorized on March 30, 2007 by AWu.